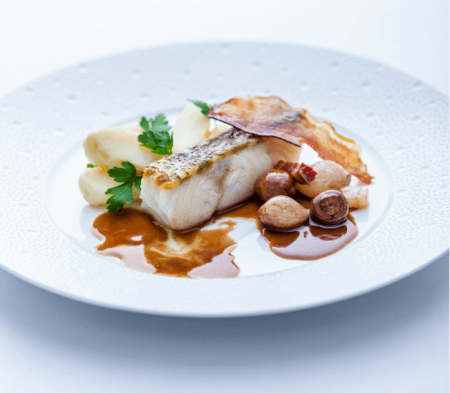 A French classic that shows that Norwegian Skrei is versatile, can take strong flavour, and can go well with red wine. Boil the onions in salted water for 5 minutes then drain. Grill 4 slices of the bacon until crisp and set aside, cut the remaining bacon into lardons (match stick size) and place in a frying pan over a medium heat until cooked with a little colour. Drain and keep the fat that has rendered. In the same pan add 1tbs butter and the fat, cook the mushrooms and onions until golden then drain, add to the lardons and keep warm. In the same pan add the sliced shallots and cook until golden, add the wine and sugar then boil until syrupy, then add the stock and boil again until sauce consistency. Whisk in the butter, check the seasoning and pass through a fine sieve. Take the sprigs of parsley and deep fry until crisp but still green, drain and season. Lightly season the Skrei, heat a pan with the oil until smoking hot. Place the Skrei in the pan and leave to colour, carefully turn the fish and add the butter, baste the fish with the foaming fat until cooked. Arrange neatly on a plate and place a slice of crisp bacon and parsley on top. Boiled new potatoes, peeled and rolled in butter are the perfect accompaniment.